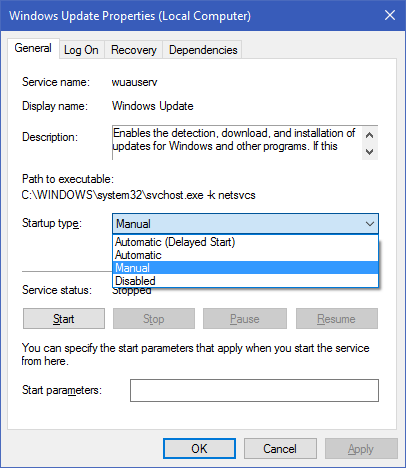 Info › Windows › How to Stop Windows 10 Automatic Updates? As you all know, the basic intention of Windows update is to power up the operating system against external threats and system-level vulnerabilities. Windows 10 updates are not an exception. But, there’s one thing that separates Windows 10 updates from those in Windows 7 or 8. Can you spot that? Unlike its predecessors, you won’t able to disable automatic windows update in Windows 10 through Control Panel Windows Update Settings. In the first look, many of you may not consider this as a serious issue. But sometimes, it can be much crucial than you think. Consider this situation – you want to turn off your Windows 10 PC. For that, you selected Power -> Shut Down option. Here comes the real trouble – the downloaded Windows updates are being installed on your PC. You really have no time to wait for updates to finish. So, you forcefully pressed the turn off button on your PC for a hard shut down. After some time, you turned on your PC again. But this time, you are seeing a Windows logo on the screen – without booting your Windows 10. Even if you restart the PC, you’re seeing the same thing. What happened is obvious from these results– your Windows 10 is crashed. It’s not necessary that your Windows 10 will crash if you forcefully abort Windows updates. But, adverse results may appear including loss of your precious files. Although Windows 10 file recovery isn’t a much demanding task now, it’s better to take precautions to avoid similar situations. And, there can have network issues, flash plugin issues, and etc after installing some Windows updates. In such situations, you may need to go “View Installed Updates” section and manually find out which update is responsible for your issue and uninstall that to resolve the issue. However, such a method is not always feasible especially if you have already installed hundreds of updates. In such situations, you’ll never know which update is the main culprit behind your system issue. So, it’s the time to find another alternative even it’s to permanently stop Windows updates. How to Disable Windows Updates in Windows 10? We’ve already discussed that it’s not possible to turn off updates in Windows 10 through Control Panel Windows Update settings. But, still there’s one more option – Windows Update service. Select Control Panel -> Administrative Tools -> Services. In Services Window, find Windows update and open it. Anyway, we never recommend you to disable Windows updates. Perhaps, the reason you’d know – Microsoft has brought a new Windows as a service model by the introduction of Windows 10. All the new features of Windows will be available only through Windows Updates. To install such new features, you will require older updates. If any major Windows update is available, you will have to install all the prior updates before trying for such major updates. ‹ How Do I Fix a Corrupted Windows System File using its healthy version?